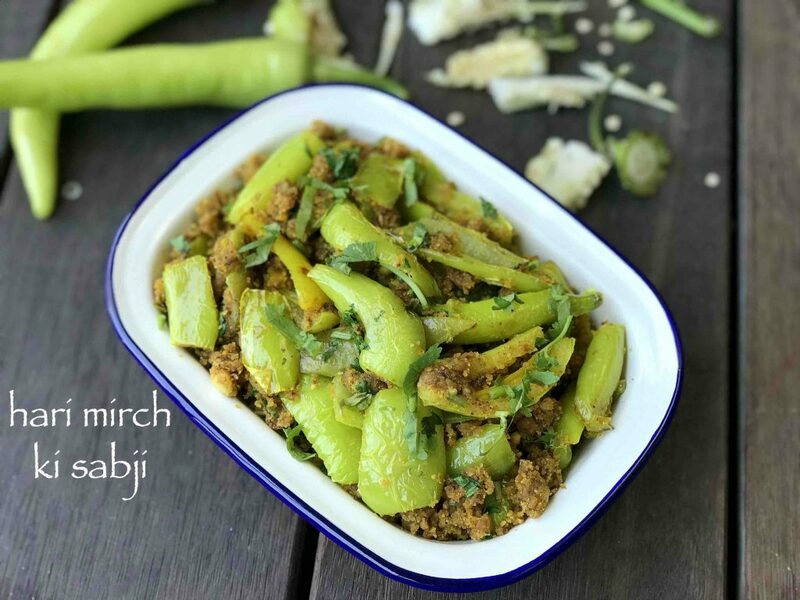 mirch ki sabzi recipe | hari mirch ki sabji | besan ki mirchi with detailed photo and video recipe. an ideal mild spicy, side dish for your lunch or dinner and can be served for both roti / chapathi. 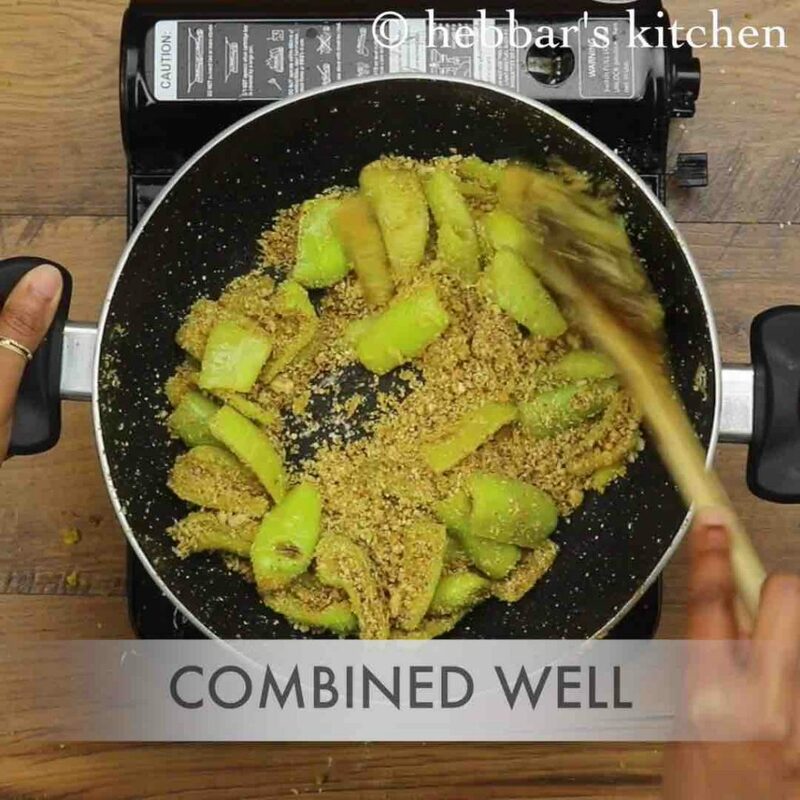 the recipe is prepared with green chilli or commonly known as yellow wax pepper or banana pepper with chickpea flour and peanut powder stuffing. 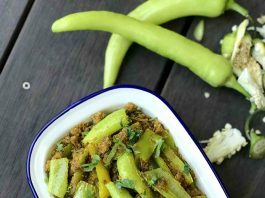 there are numerous ways to prepare hari mirch ki sabji, but this recipe is very much inspired from maharashtra cuisine. 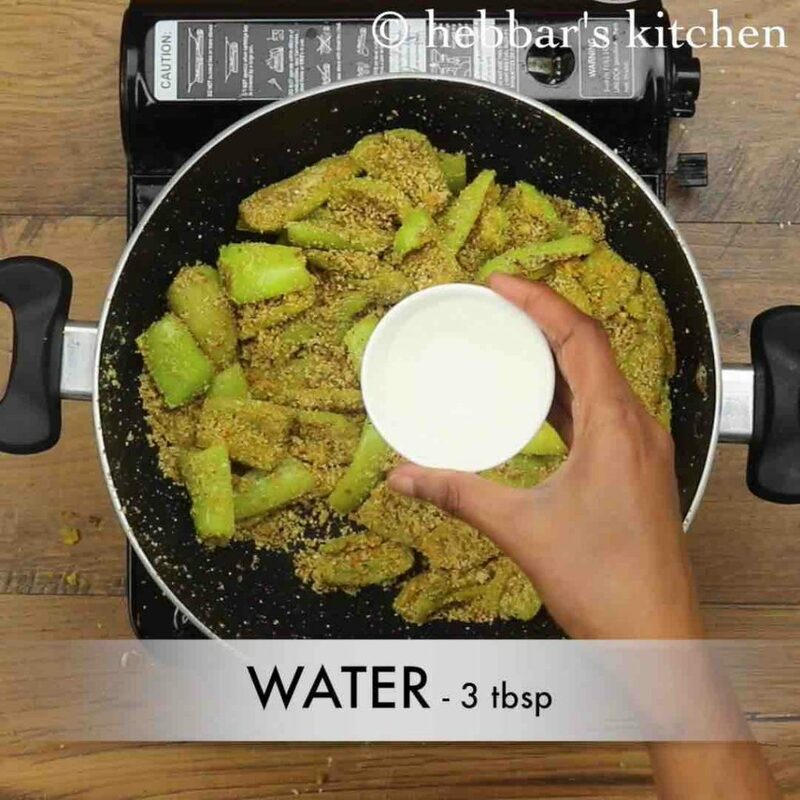 mirch ki sabzi recipe | hari mirch ki sabji | besan ki mirchi with step by step photo and video recipe. 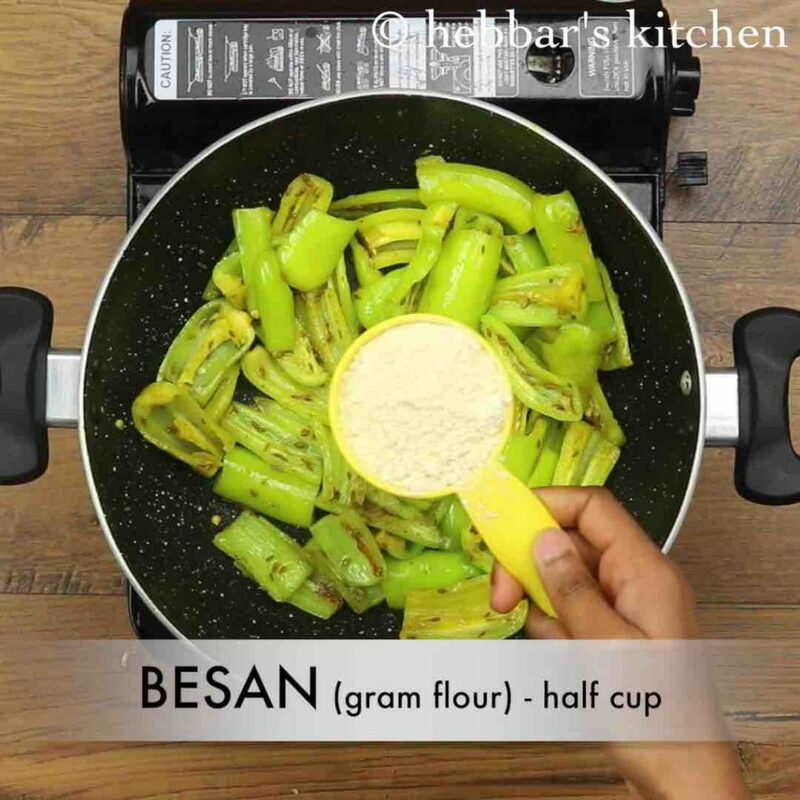 the recipe for besan ki mirchi is extremely simple and can be prepared within minutes. also one may have impression that, side dish from chilies can be exceedingly spicy. but this recipe with banana pepper is a mild spice sabzi. besan ki mirchi sabji is also a popular rajasthani cuisine side dish recipe and is mainly served with dal baati recipe. however in this recipe post i have used the combination of besan and groundnut powder as the stuffing which brings further down to maharashtra. in maharashtra it is mainly served as side dish to rice and dal amti or with jowar bhakri. but i personally love this hari mirch ki sabji as a side dish with my dal rice recipe with some extra mango pickle and some ghee topping. i even prepare the same recipe with long dark green coloured chilli. comparatively these are hotter and i wouldn’t recommend if you are not spicy food eater. 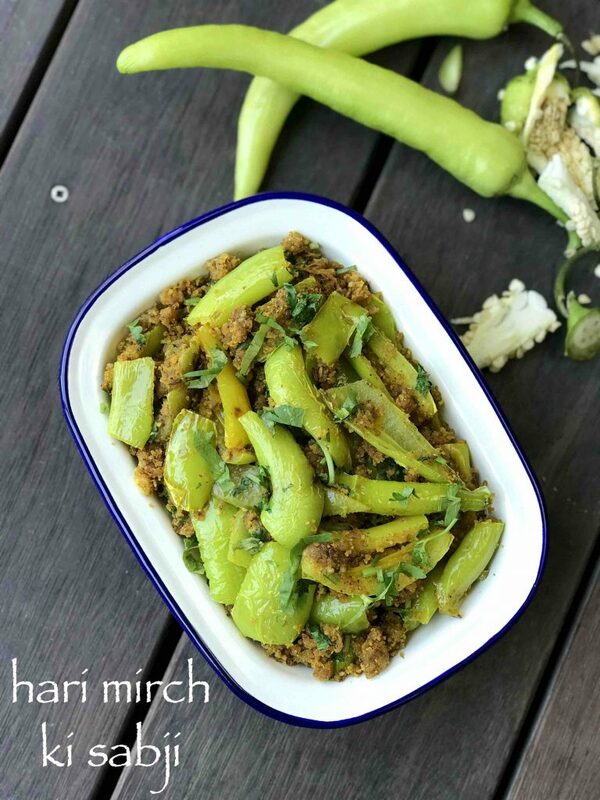 furthermore some important tips and recommendations for a perfect spicy hari mirch ki sabji recipe. firstly, and more importantly i have de seeded the chilies before using it in the sabzi. this should lower the spice level and i heavily recommend to do the same. if you are comfortable with the spice level, than add the seeds accordingly. secondly, adding desiccated coconut would lower the the temperature further down but it is completely optional and can be ignored, lastly, i have slit the banana peppers vertically before using it in the sabzi. alternatively you can cut them cylindrical with a hollow in between. the space can be used for spice stuffing. 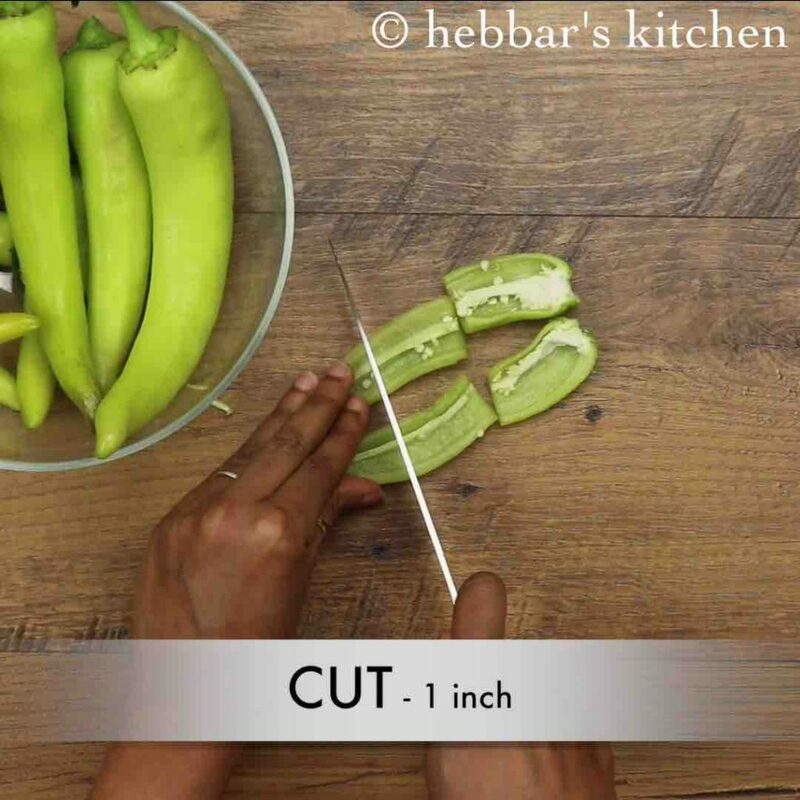 firstly, cut the green chilli to 1 inch size removing off the seeds. 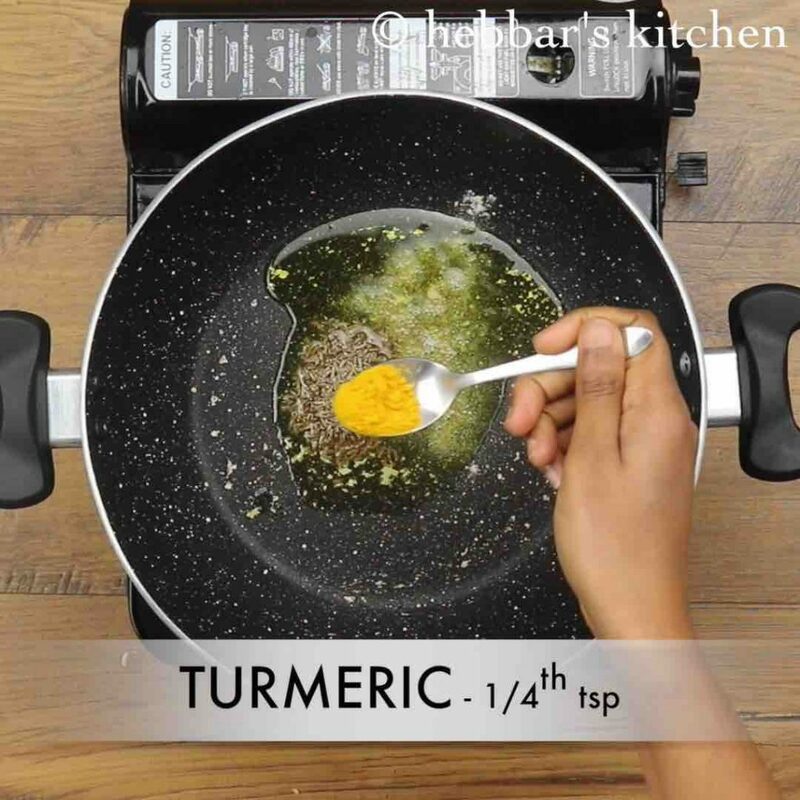 now heat 3 tsp oil in large kadai and add 1 tsp cumin, pinch of hing, ¼ tsp turmeric. saute on low flame. 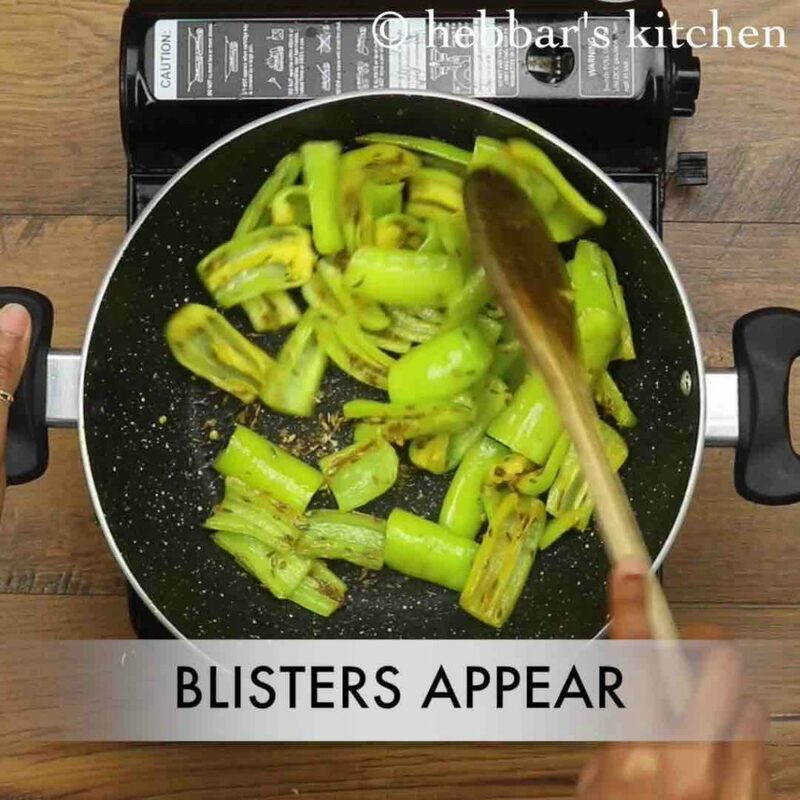 further add chopped chilli pieces and saute for 2 minutes or till blisters appear. add in ½ cup besan and roast continuously for 5 minutes. 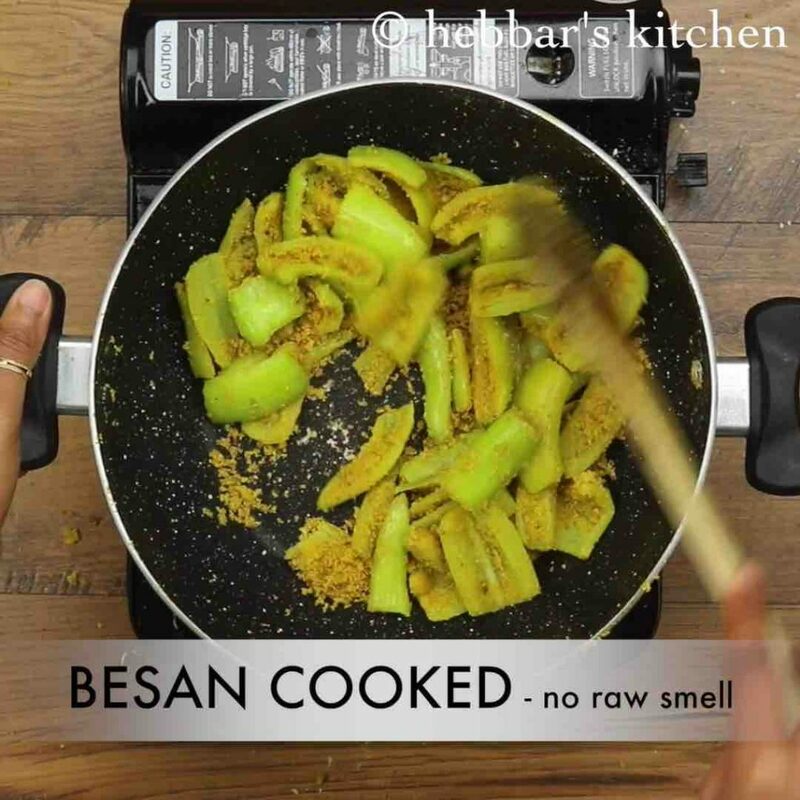 roast till the raw aroma of besan disappears and turns golden. 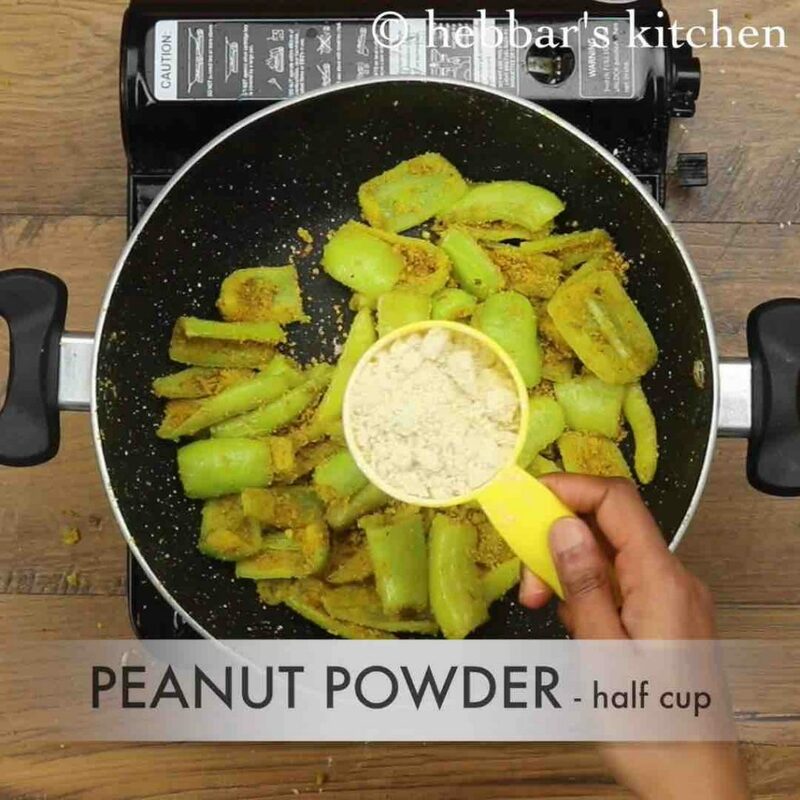 furthermore add ½ cup peanut powder, 2 tbsp coconut , ½ tsp garam masala, 1 tsp aamchur and ½ tsp salt. saute on low flame, till the spices turns aromatic. 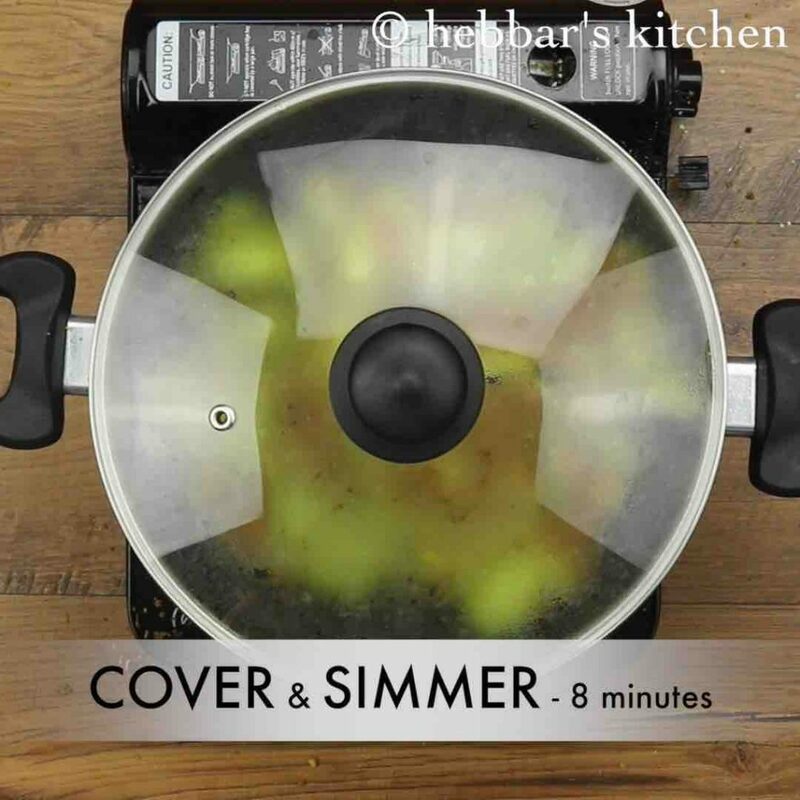 cover and simmer for 8 minutes or till sabji gets cooked completely. finally, garnish with coriander leaves and serve mirch ki sabzi recipe with rice or chapathi. firstly, deseed the chillies, else it will be too spicy. also, you can prepare this sabji with regular chilli or capsicum. further, roast besan well else the raw flavour will remain. finally, mirch ki sabzi recipe taste great when prepared slightly spicy and tangy.